I’ve somehow been commissioned to create a permanent interactive audio-artwork in the centre of Cardiff. How this happened is a random series of events (a chance meeting and conversation with Emma Price, then an unexpected request for me to propose some new ideas to the commissioning body), but I have to admit to feeling a little bit like a fraud. Although I’ve brought many creative projects to fruition, I don’t really consider myself an artist. And yet my presentation, which consisted of a little bit of rambling about loving Cardiff and bringing a tiny bit of joy to everyone’s day, plus showing a couple of Youtube vidoes, resulted in me beating a handful of professional creative practitioners to the commission. And so I must apologise to them first. I hope the piece I build does the site proud. I’m planning to build a “human windchime” at the underpass between two parts of St David’s shopping centre on Hills Street, the thoroughfare between The Hayes and Charles Street. My primary objective is to provide an experience that will inject a little bit of joy into the day of anybody who interacts with it, whether they are aware of their interaction or not. By walking under a row of sensors they will trigger different sounds. In this way they will act as a human breeze that creates a wind-chime of beautiful sounds. The busier the underpass, the heavier the “breeze”. 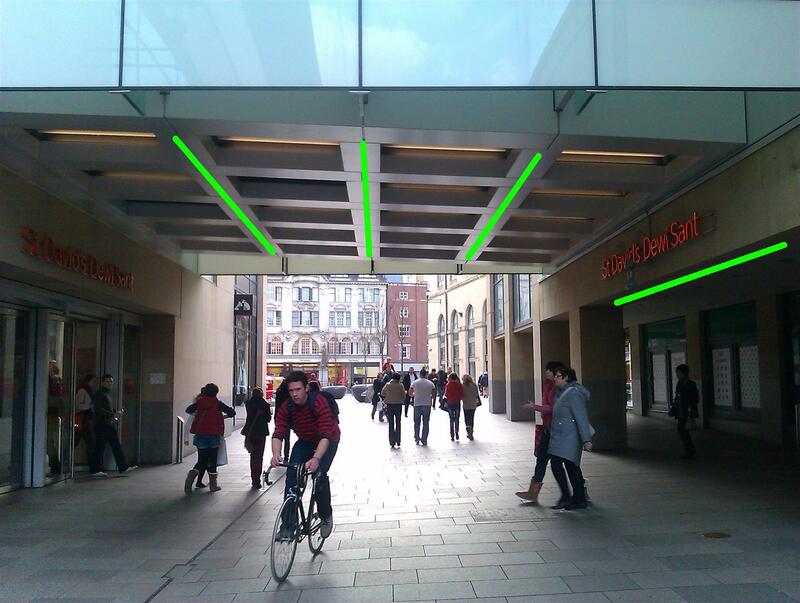 I plan to install a line of discrete sensors across the thoroughfare between the two parts of the shopping centre. Depending on the directionality and sensitivity of the sensors available, I will place between 11 and 16 sensors in a line, each of which will be assigned a sound, probably using a major pentatonic scale, so that every note will sound pleasant and harmonic with every other. The green lines on the picture below display the possible locations for the sensor row. As someone passes under a sensor, it will trigger a particular sound, the tone of which will differ depending on which end of the sensor-row they pass under. Passing on the far right would trigger a high note, and passing on the far left would trigger a low note, for example. I plan to incorporate a light with each sensor that glows when the relevant sensor is triggered. At busy times the windchimes will be constantly playing as shoppers pass continually underneath it. In the dead of night, maybe a single solitary note would quietly ring out as a weary clubber triggers it as they weave their way home. As well as it being a seemingly random set of sounds being generated, I hope that some people would take the opportunity to “play” the installation, even if only briefly. I would love it if we could encourage “flashmobs”, site-specific dance or theatre pieces, or any musical activity that could incorporate playing it as an instrument. Through a dedicated website, I plan to stream a live feed of the sounds being created over the internet. This would allow anyone to tune in and listen to the human windchime anywhere in the world, perhaps watching via a webcam. I anticipate that some people would tune in to use these random windchimes as a means of relaxation, or re-connecting with Cardiff. To increase the public participation with the installation (which is really important to me) I would like to encourage musicians and creatives to submit their own banks of sounds that would be applied, say, monthly. One month may be a local vocalist singing those particular notes, the next may be bird song recorded around Cardiff, and December could feature jingle bells! Different global partners may be particularly interested in this. Perhaps sounds sent from Cardiff’s twin cities of Stuttgart or Xiamen might be featured. This public participation could feature a social element, maybe with a Twitter hashtag and Facebook voting, making the piece constantly fresh and shared on social networks. I also believe there may be an opportunity for mobile phone apps as part of this, again increasing public participation. I don’t have a definitive idea as yet, but believe there may be a great opportunity for someone on an iPhone, for example, to download the last 30 seconds they just heard. Or perhaps to have their own mini-version on their handset. Or maybe to be able to have some subtle influence on the volume or pitch of the notes. I would love this installation to excite and inspire people to interact with it actively as well as passively, and bring a moment of joy to all those that come into contact with it. I’m currently looking for people with the relevant skills to help me bring it to life, so get in touch if you think you have the necessary skills. Wow, love this idea Neil! Really cool. You’re an artist if you do art. You’re doing art. Of all the things you don’t need formal qualifications for art in it’s various forms is at the top. Anyway, it’s a great idea, can’t wait. This sounds pretty amazing, I’d love to be of any help. I live in Grangetown, currently unemployed, previously an estimator in the construction industry. Email me if I can help. Brilliant, thanks Paul. Will put you on the list to contact. Thanks! Will echo Maf’s words – you’re one of the most creative people I know and not being a specific ‘artist’ is definitely needed in these types of projects… know you will knock it out of the park and can’t wait to read / watch more as it progresses – proud of you sir! Love the idea of it being streamed as well – reminds me of http://youarelistening.to/ – maybe some inspiration there? PS random thought: maybe the sounds change depending on the day… morning could be bird sounds, in the day happy cheerful sounds and in the evening more ambient tones…? Yes, love the LA police/ambient mashup! Used to listen to that if I couldn’t sleep. And the idea about time-of-day specificity is brilliant! Had only ever really thought of it as a time-of-year change…. And thanks for the kind words and tweet out. Neil, following on from the time of day specificity idea, how about an occasional random element to the night time sounds? something a bit messed up for say very 500th person who passes in the wee hours? Way to pass into urban legend…. Oooh, that’s a nice idea! As one of those people fortunate enough to have been to Xiamen and Stuggart I would recommend using the sounds of Xiamen Old Town market and the Mercedes-Benz Arena. To fantastic places that encapsulate the Cardiff’s twin towns. Sounds like some nice ambient landscapes could be built around that! Hi Neil, a friend just sent me your post – sounds like an amazing project! We’ve been looking into a prototyping platform called Arduino: http://www.arduino.cc/ – and I wondered if it might be useful for your project. We’re looking at ideas or ways of using this for an event or challenge that ties in with Cardiff Design Festival at the moment. The website talks about sensors that generate actions and how this can be used to feed data to the web – so it sounded similar to what you’re trying to achieve with your live stream of sound. Good to hear from you. Yes, I know the Arduino well (through skilled friends – I wouldn’t have the first clue!). It’s one bit of kit I’ve been assessing for the project, along with the Rasperry Pi (http://www.raspberrypi.org/). Working out what kit to use, and who to build it for me, is going to be the toughest part! Let me know if you fancy getting coffee to chat about it sometime.